It looks like I got one of my biggest makeup wishes. 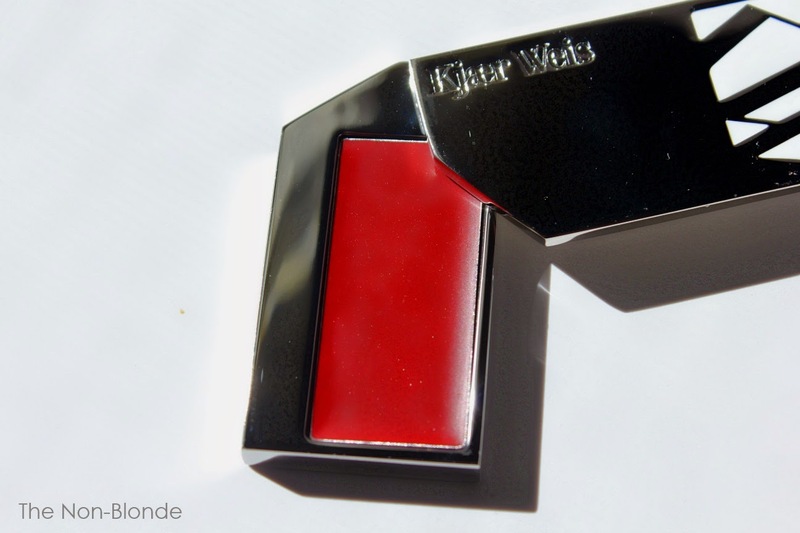 A redder, more intense color of Kjaer Weis lip tint. I've already finished two pans of Passionate (the sheer berry red), so Lover's Choice (Fall 2014 release that joins the permanent line) comes at the perfect time. It's closer to a classic red and responds well to your natural lip color, so it works as an everyday red. I find it very flattering on me (pigmented lips, NC 30-35ish skin with a distinct green undertone, very brown hair), but think that even the fair ones can pull it off with aplomb. 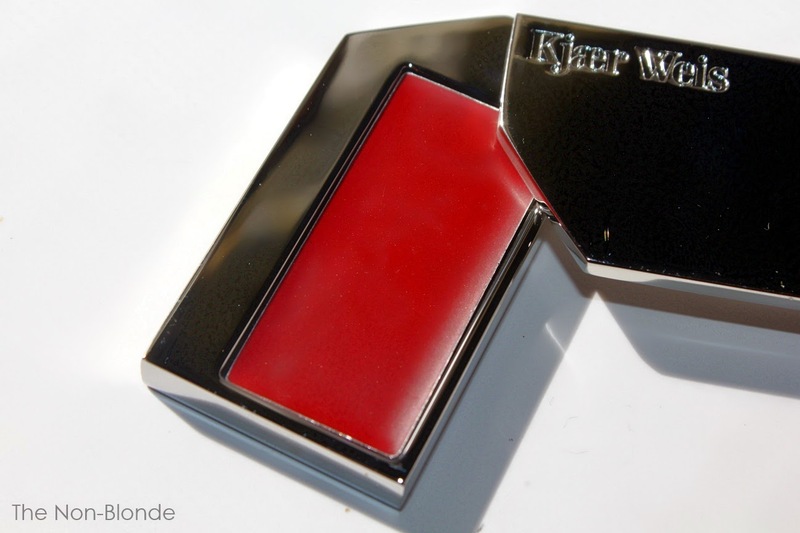 I love the formula of Kjaer Weis Lip Tint. It's balmy and pampering, never goopy, and looks polished and lovely. 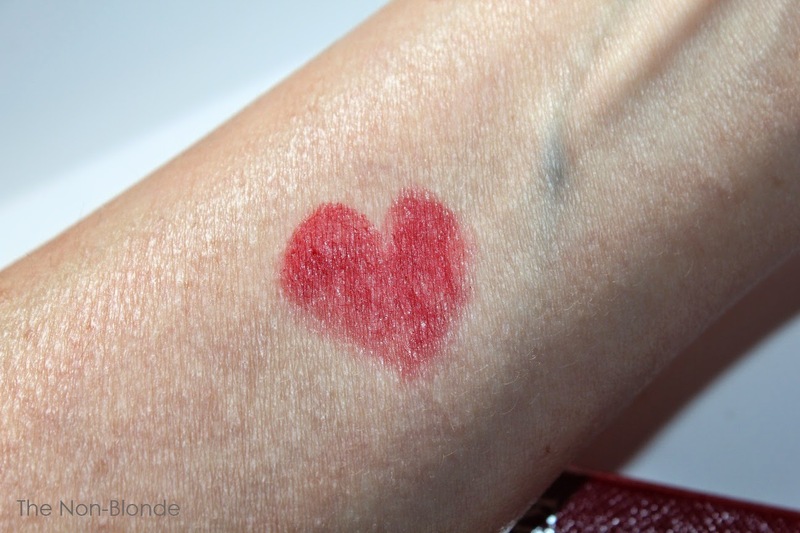 Coverage is usually sheer, though Lover's choice is at least one level more opaque, and pigment intensity is buildable. The swatch you see above shows two coats of Lover's Choice. It looks like any good liquid lipstick, I think. I use a lip brush, and recommend that you do the same (Kjaer Weis has a well-designed lip brush). As with any other products from this brand, you can purchase the pan with the sleek compact (a Marc Atlan design), or just the refill and stick it in a Z-Palette or something similar). Longevity is pretty basic, though Lover's Choice does leave some stain behind. The lip tint doesn't feather or migrate, just sinks into the lips or transfers a bit when you eat. Take into account the need to reapply a couple of times throughout the day (a good enough reason to get the compact and carry it in your purse). Kjaer Weis Lover's Choice Lip Tint ($49 or $29 for the refill) is available from OsswaldNYC.com or directly from kjaerweis.com. If you need help with choosing colors or application advice, I highly recommend calling Osswald (212-625-3111), where Dustin and Josie can answer all your questions (and then some). The product for this review was sent for my consideration by the company.